PSEG LI have a plan for LI. Is it really good enough? Use our online comment form to let them know we want renewables and a 21st century grid we’re paying for, that works for all Long Islanders. Comments due by MARCH 6, 2017. Long Beach Reach annual awards (l-r) Long Beach City Councilman Anthony Eramo, Long Beach Reach Executive Director Joseph Smith, State Senator Todd Kaminsky, Honoree Debora Staiano, Honoree Kevin Reilly, Honoree George Povall, Honoree Betsy Glazer, Chairman Scott Nigro and Long Beach City Councilwoman Eileen Goggin. All Our Energy President George Povall was honored on October 23, 2016 by Long Beach Reach at their Annual Awards Brunch for our work on environmental issues. Thanks to our team, our allies and volunteers whose work and support made this possible. Congratulations to the other honorees we are very humbled to be included with-Betsy Glazer, Kevin Reilly and Debora Staiano. We also thank the board and membership of Long Beach Reach for such an honor and recognition of our work. Thank you all, including Scott Nigro, George Trepp, Carolyn Cuttler, Rosalie Machalow, and the members including Eileen Goggin and Executive Director Joseph Smith, Ph. D.
Thank you also to all the representatives and officials who also congratulated us- Congresswoman Kathleen Rice, Senator Todd Kaminsky, Nassau County Executive Mangano, Nassau Comptroller George Maragos, and Long Beach City Council-Len Torres, Anthony Eramo, Eileen Goggin. Scott Mandel, and Anissa Moore. We’re very grateful, have huge admiration for their work, and you can donate to Long Beach Reach at this link. On Thursday 10/13/16, coalition members New York Communities for Change, Long Island Progressive Coalition, and All Our Energy are holding a Town Hall event on Long Island, part of a series we’re doing across the state to engage communities and hold our elected officials accountable. Want to learn more about the coalition and our policy platform? Want to come together with diverse constituencies from across LI dedicated to climate justice? RSVP now for the NYRenews Long Island Town Hall on October 13th! At this first town hall meeting, find out about the climate policy platform NY Renews is trying to pass in Albany, and who’s in the coalition. We’re bringing together climate activists, economic justice advocates, and labor voices from across LI to talk about a statewide ‘just transition’. State officials will be in the room and our goal is to keep them accountable by demonstrating our people power and having them hear from community members. Find out about upcoming NYR activities on LI and how people can take action locally to support the statewide campaign. All Our Energy will be part of the panel for this event. Join the launch of the ISSP-Greater NYC film series, Sustainability In Focus, and an outdoor terrace celebration of the inaugural year! Sustainability In Focus kicks off with the award-winning Ocean Frontiers II. Produced by the visionary Green Fire Productions, Ocean Frontiers II travels off the shores of New England where a wave of big ships, energy industries, and a changing climate are now testing the limits of an already crowded sea. But on a pioneering path of far-sighted planning—pushed by blueprints for offshore wind energy—old residents and new have come together to keep their ocean and livelihoods alive. A deeply researched film, Ocean Frontiers II reveals the issues within the pending Mid-Atlantic Ocean Action Plan, just recently released to public comment before being finalized this fall. Following the screening, an expert panel will discuss the Mid-Atlantic Ocean Action Plan and its potential impact on the Northeastern seas of the United States. After the panel, ISSP-Greater NYC invites you to an outdoor reception overlooking Rockefeller Plaza to celebrate our chapter’s inaugural year! Screening: 6:00pm (Please note that the screening begins promptly at 6:00pm and unfortunately no latecomers can be admitted). Wines and refreshments will be provided. Join our media-worthy action/demonstration for the next LIPA Board meeting and preparing to help everyone testify at the upcoming Clean Energy Standard (CES) hearings. Somehow, they are scheduled for the same day!! Naturally, we are responding with a Day Of Action for renewable energy!!! Will you join us? Please click the RSVP’s below and let us know!! 10:30am Group Turbine Raising then March Giant Plugs into LIPA offices. We will hold a demonstration of our support for a just transition away from fossil fuels and the rapid development of economical and readily available offshore wind for Long Island’s power needs. Participate in this creative action at LIPA headquarters to create newsworthy visuals that provide great media imagery, as we collectively raise a “wind turbine” and brandish laughably oversized plugs as we invite LIPA to lead the way and “plug us in” to offshore wind! That evening on May 18th, Long Islanders will descend on the Clean Energy Standard hearing in Mineola to help spark a renewable energy revolution in the Empire State. It’s time for a renewable energy future in New York! Governor Cuomo aims to have 50 percent of the state’s energy come from renewables by 2030. This new goal must be enforceable so it lives up to its promises and must include a specific commitment and path to large-scale offshore wind development that could create thousands of new jobs here on Long Island. Additionally, the CES must apply to LIPA, as is proposed by the Public Service Commission, to ensure compliance and uniform standards for all NY power producers. There are Clean Energy Standard Hearings also in Riverhead (5/17) and Far Rockaway (5/18) – we are not covering these, but we can get you the info if you need-just ask! bring your advocacy, passion, organization, and artistic talents to make this memorable, fun and have a big impact! WE NEED YOUR HELP! I know together we are going to make a big statement and help move the conversation from “if” to “how” to NOW! May 27, 2014. 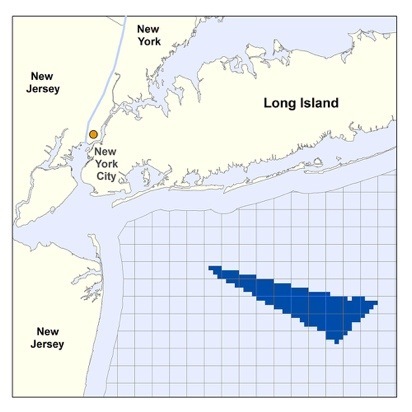 Today the Bureau of Ocean Energy Management, as part of President Obama’s Climate Action Plan to create American jobs, develop domestic clean energy sources and cut carbon pollution, announced it will move forward with a competitive bid process to lease the designated Wind Energy area off Nassau County’s South Shore. 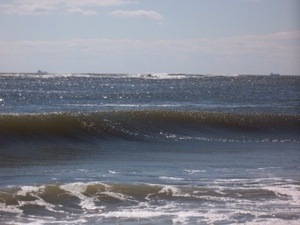 The area, at its smallest point, starts 11 miles off Long Beach, NY. It widens and moves away from that spot, to approximately 19 miles away(see map). This area will be just barely visible from shore on clear days. The turbines should appear shorter and many times less wide than the majority of tanker and cargo ships that continuously sit off Long Beach on any given day. 2) existing commercial and recreational fishing activity in and around the region. In editorial response to these issues, All Our Energy are already on record AGAINST the LNG port for a multitude of reasons. You can find that information here : Stop the LNG Port Off Our Shore from June 2013. We believe properly sited, with environmental best practices used, through companies committed for the long term, with long term price assurances, this will be the best thing to happen to assure Long Island’s clean energy future.